Aliphatic Nucelophilic Substitutions can be useful reactions. A minor drawback is the low natural occurrence of alkyl halides. Alcohols are much more common. We could do nucleophilic substitutions on alcohols. The trouble is, oxygens are less polarizable than halides. A hydroxide ion is less stable, and harder to form than a halide ion. They don't make very good leaving groups, comparatively. One way around that problem would be to protonate the oxygen. Attached to the carbon, it is a cation. Once it leaves, it becomes a neutral. The issue of ion stability is sidestepped. The trouble is, plunking a compound into concentrated acid is not always a reliable way to get things done. For that reason, it is pretty helpful to be able to turn alcohols into alkyl halides, or otherwise turn hydroxyls into stable, anionic leaving groups. One of the most common synthetic methods of converting alcohols into good candidates for nucleophilic substitution is to convert the hydroxyl into a halide through the use of a phosphorus reagent. Phosphorus tribromide is frequently used to make alkyl bromides from alcohols. This reaction itself involves a sequence of nucleophilic substitution reactions. In the first, the oxygen atom in a hydroxyl group acts as the nucleophile and replaces a bromide on phosphorus. In the second, the displaced bromide ion rebounds to displace the oxygen atom from the tetrahedral carbon. This mechanism is aided by the strength of the strong phosphorus-oxygen bond that is formed. The phosphite that forms is a very good leaving group. Another common method is to turn the hydroxyl into a sulfonate ester, such as a mesylate or tosylate. Again, the oxygen atom acts as a nucleophile, displacing a halide from the sulfur in a sulfonyl chloride. This is very similar to the bromination with phosphorus tribromide, but the sulfonate ester waits, poised to be displaced by a nucleophile. In fact, tosylates are generally even better leaving groups than halides. Biologically, something very similar to both of these processes sometimes happens. The alcohol unit is converted into a phosphate. The alcohol can be phosphorylated by a molecule of ATP. Again, the phosphate portion of the molecule is a very good leaving group. Provide a mechanism for the reaction of phosphorus tribromide with 2-pentanol, based on the description provided. Provide a mechanism for the reaction of mesyl chloride with 2-pentanol, based on the description provided. Sometimes in formation of sulfonate esters, halogenation occurs by accident, forming an alkyl chloride. 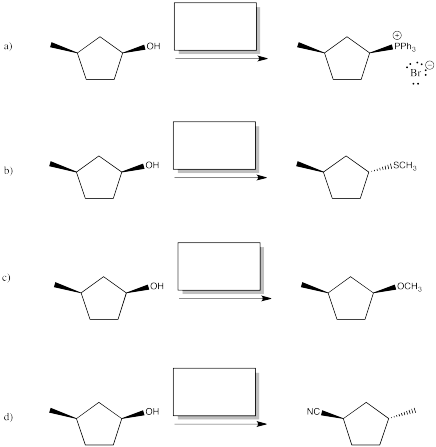 Show how that might happen by continuing on from the mechanism of formation of a mesylate ester from mesyl chloride and 2-pentanol. One way of preventing side reactions during synthesis of sulfonate esters, like the one in the previous question, is to perform a two-phase reaction. For example, the reaction might be performed in a mixture of water and dichloromethane, with a little added sodium hydroxide to act as a base. Show how this approach would limit the chlorination reaction. Provide reagents (or series of reagents) to accomplish the following transformations. Mitsunobu addition is a one-step method of replacing an alcohol's OH group with a nucleophile. In the following case, the original oxygen atom has been completely replaced. You may be able to guess where it goes based on other reactions you have seen here. Propose a mechanism for this reaction, but don't worry about what DEAD does ( that is a more advanced topic).